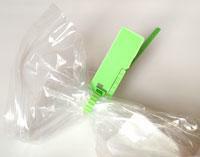 Mini Baglock waste bag security seal - Buy now online. Mini Baglock is a polypropylene, pull tight, tamper evident security seal, designed as a cost effective seal for clinical waste bags, sensitive waste bags etc. It is available in three sizes, supplied in multiples of one thousand seals, pre printed with sequential numbers and is normally available for dispatch within 1-2 working days. Polypropylene, pull tight, tamper evident security seals. 4mm width. Pre printed with sequential numbers. 300mm side tear off @ £75.00 per 1,000 excl VAT. Available in a limited range of standard colours as above.